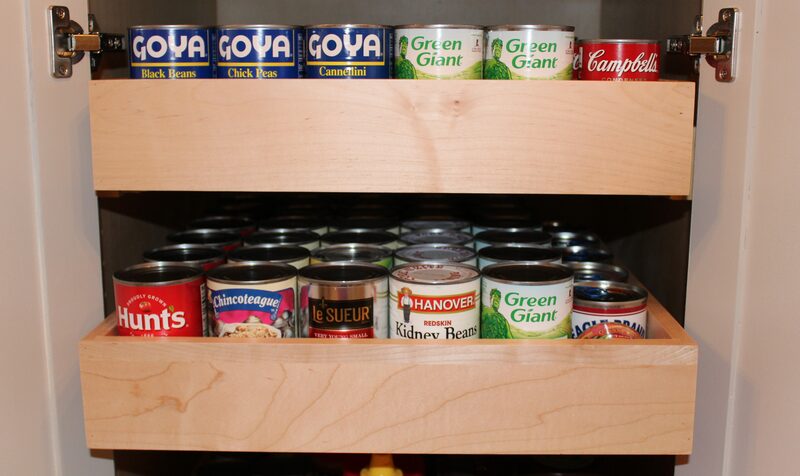 Home DIY Projects	How to Organize Pull-Out Drawers in a Pantry! Happy Wednesday, friends! Yesterday I showed you the amazing pull-out drawers my husband installed in our Butler’s Pantry. And then I spent most of the afternoon filling them up! Come see how organized the pantry looks now! A few hours later, all 5 of the pull-out drawers were installed! Each drawer can hold up to 75 pounds. We really could have fit at least another drawer or two into this cabinet, but my husband felt like it would be better to have space in between the drawers so you can better see what is in each drawer. I tend to agree. It took a while to pull all of the cans and food items out of the other cabinets and assemble them into groups. I filled the top two drawers with all canned goods, keeping like vegetables together. The middle drawers holds staples such as mustards, mayonnaise, pastas, quinoa and snacks. The bottom drawer holds mostly baking items like sugar, flours, chocolate chips, oatmeal, etc. A place for everything and everything in its place! Normally, I don’t keep this many canned goods on hand, but I just went to BJ’s and this tends to happen when buying in bulk, right? Plus, I didn’t realize I had 14 cans of black beans, and four bags of brown sugar until I started pulling things out of the cabinets. This is a problem with not having pull-outs. Things get stuck in the back, and I forget they’re there. Never again! To make the pull-out drawers even better, is the fact they are illuminated by my double crystal chandeliers! Now, the Butler’s Pantry is finally complete! My amazing husband did so much of this remodel himself, only hiring out the trickiest parts like the electrical and the raising of the cabinets. He did the tile, painting and installed the pull-out drawers, to name a few. I help as I can by being the bossy assistant, painter, ladder-holder, picture taker and chief go-fer. We make a great team! Here are a few more before and after pictures that show a bit of the transformation of the Butler’s Pantry. We couldn’t be happier with how the room turned out! Plus, we have the satisfaction of saying we contracted the entire project and did most of it ourselves. And, saved thousands of dollars in the process!